This profound spiritual legacy explains the failure of Darul Islam, Jemaah Islamiyyah and other extremist movements, which have never been able to convince a majority of Indonesians of the need for an Islamic State. It also explains why ISIS propaganda is relatively ineffective in Indonesia (where less than 2 persons per million inhabitants have joined ISIS), in contrast to Tunisia (273 per million inhabitants), Libya (95 per million), Saudi Arabia (79 per million), Belgium (39 per million inhabitants, but in fact 649 per million MUSLIM inhabitants), or France (19 per million inhabitants, and 187 per million Muslim inhabitants). The Nahdlatul Ulama (NU) was founded in 1926 by heirs to the Walisongo tradition, in direct response to the Wahhabi conquest of Mecca and Medina. ISIS and al-Qaeda are both “Wahhabi” movements, known for their enmity to the spiritual traditions of Islam; their systematic destruction of saints’ tombs; and virulent animosity towards those of other faiths. 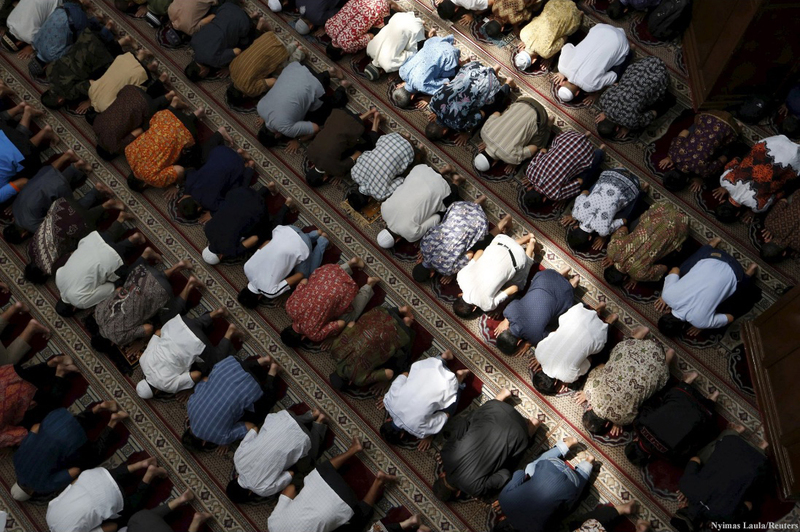 Muslims praying during Ramadan at a mosque in Jakarta in Indonesia. The country has the world’s largest Muslim population. “A 50-million strong Sunni movement in Indonesia just launched a global anti-extremism campaign…. As suggested in a 2012 article in the Indonesian policy journal Strategic Review, pluralism may be the ‘big idea’ that Indonesian Islam can bring to the world stage… Indonesia’s national motto is bhinneka tunggal ika, or ‘unity in diversity,’ and that ethos is central to the country’s Muslim traditions. “In a 90-minute film released by NU called ‘The Divine Grace of Islam Nusantara,’ Indonesian Islamic scholars systematically criticize and denounce the Islamic State’s interpretations of the Quran and Hadith….” Read the full article (PDF). “Nahdlatul Ulama, the world’s largest independent Muslim organisation, is exporting Indonesia’s traditionally tolerant Islamic values as the religion’s authentic form, an antidote to nihilistic radicalism tearing apart the Middle East. . . . NU has this week launched Rahmat Islam Nusantara (The Divine Grace of East Indies Islam), a video explaining Indonesian Islam’s origins and theology, fiercely rebutting Islamic State and Wahhabi fundamentalism.” Read the full article (PDF). “Indonesia’s largest Muslim organisation, Nahdatul Ulama (NU), has joined the global battle against radical ideology, producing a documentary film to draw the line between moderate and radical Islam. . . . 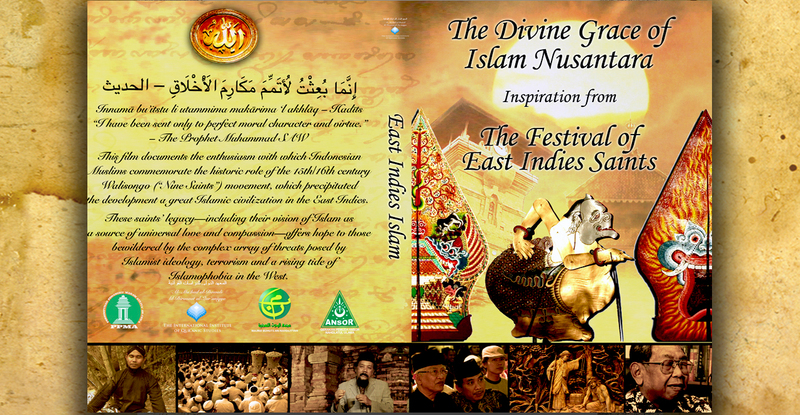 In its 90-minute documentary film The Divine Grace of Islam Nusantara, NU explains how Islam has spread in the archipelago through local wisdom and culture. And the teachings of the nine saints in mainland Java – popularly known as Wali Songo – is at the heart of this Islamic tradition that promotes peace and tolerance.” Read the full article (PDF). “Nahdlatul Ulama, an Indonesian Muslim organisation, claims to have 50 million members, more than one in four of Indonesia’s Muslims. This week it released a feature-length film, The Divine Grace of East Indies Islam, which, from a foundation of Sunni theological orthodoxy, challenges Isis head on. Against Isis footage of prisoners being marched to a river bank, shot in the head and dumped in the water, the soundtrack declares, ‘Many who memorise the Koran… love to condemn others as infidels while ignoring their own infidelity to God, their hearts and minds mired in filth.’” Read the full article (PDF). “In late November, two weeks after the deadly terrorist attacks in Paris, Indonesia’s largest Muslim group, Nahdlatul Ulama, launched a video campaign aimed at countering extremist ideology. International media hailed the video as a call for tolerance that could eventually help undermine the Islamic State, the militant group behind the attacks. . . . The 90-minute film, titled Rahmat Islam Nusantara (The Divine Grace of East Indies Islam), urges Muslims not to take too rigid a view of Islamic scripture and to put more focus on the human side of Islam. The film encourages them to follow in the footsteps of the wali songo, the nine earliest propagators of Islam on the island of Java who are said to have spread the religion through peaceful means, allowing assimilation with the local culture.” Read the full article (PDF). “Said Aqil is keen to stress that NU and Islam Nusantara is about peace, not conflict. Yet it is not difficult to see NU and Ansor taking out the knives once again, this time not against communists, but against hard-line Wahhabi groups if they continue to contest the right of Indonesian Muslims to believe in the religion that has been theirs for centuries. “So far it has not come to that. But in distributing the film The Divine Grace of Islam Nusantara widely, NU is mounting a direct challenge to Islamic State and the Wahhabis. Yahya Staquf states that the film is an invitation to Muslims everywhere to reject radicalism and theological straight-jackets and stand up for their own cultural adaptation of Islam. “‘They have the right to be Muslims and still retain their own civilization and culture. What the world needs now is to learn about the true nature of the threat. Islamic State is a part of Islam and the threat is real. We need to build a coalition and the will to combat this, [including] a consensus on how to address [this] threat to all humanity.’” Read the full article (PDF).